YouTube has faced its fair share of copyright controversies, one even more absurd than the others. In what appears to be an indirect censorship effort, a company claiming to represent the German National Library is now claiming copyright on the 87-year-old Nazi anthem, taking down a historical documentary in the process. When it comes to Nazi propaganda, Germany has an extensive censorship track record. After the Second World War it was policy to ban all Nazi propaganda, most famously Hitler’s Mein Kampf. Even today the issue is still a hot topic. For example, earlier this week our attention was drawn towards a rather unusual censorship effort on behalf of the German National Library. 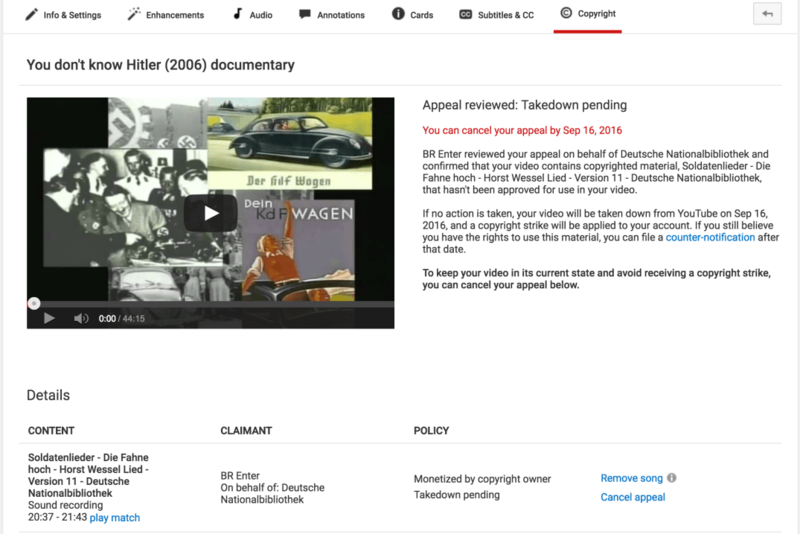 Represented by BR:Enter Music, the Deutsche Nationalbibliothek sent a takedown request to YouTube, targeting the historical 2006 documentary You Don’t Know Hitler. The film in question serves as a reminder of the horrors Hitler brought forth. It is composed of historical material and other propaganda footage, including clips from Leni Riefenstahl’s 1935 film Triumph of the Will. The content that triggered the takedown request is a version of the infamous Horst Wessel Lied, also known to a wider public as the Nazi Anthem. According to the claim, the library owns the right to the recording. Update: September 26 The Deutsche Nationalbibliothek informed us that, contrary to what the takedown message states, the reporting agency doesn’t work on their behalf. “BR:enter does not represent DNB,” they informed us. Documentarian and filmmaker James K. Lambert informs TorrentFreak that this is not the first time that his film has been targeted, but usually these claims are dropped when he protests them. This time, however, that was not enough. The National German Library insists that the film infringes on their rights and as a result the filmmaker has been slapped with a copyright strike. While it seems strange that the German state would own the rights to a 87-year-old song it didn’t produce, the issue is a bit of a minefield. Over the years, Germany has indeed obtained the copyrights to a lot of Nazi propaganda, some of which are still enforceable today. On the other hand, there is a long history of denying Nazi copyrights or permitting its use, starting with the US Government which sanctioned it in Frank Capra’s counter propaganda series Why We Fight. What’s clear, however, is that after all these years Nazi copyrights are still being enforced. This is something Lambert is fiercely protesting. According to the documentarian, people have the right to see history for what it was. “Nazi propaganda is part of the criminal record of their Crimes Against Humanity; they are not marketable commodities that should exclusively belong to anyone,” Lambert tells us. To get his documentary reinstated Lambert submitted a counter-notice which he documented in detail in a lengthy blog post. According to Lambert the song he used is in the public domain and even if it isn’t, it would fall under fair use. TorrentFreak contacted both BR:Enter and the National German Library several days ago asking for comment on the issue. However, at the time of publication we have yet to hear back. (see update above). Lambert hopes that his counterclaim will be accepted and that the documentary will be reinstated soon. For the future, he hopes that YouTube will improve its processes so it can better deal with these fair use cases, keeping the rights of documentarians in mind. “This matter should never have reached this absurd point. YouTube should not have given unquestioned deference to BR Enter Music’s claim against me and my documentary should not have been taken down from YouTube. “I hope this counter-claim will finally resolve this matter and restore the video to my channel because I am completely within my rights to have made this film and to publicly show it to others,” Lambert concludes. 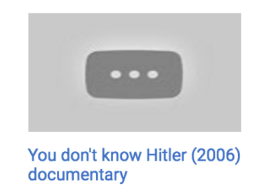 For those who are interested, Lambert’s documentary You Don’t Know Hitler is still available on Vimeo. Update September 27: The copyright claim has been lifted.